PCC’s high intensity, multifuel, low NOx burners, and combustors have set the standard for quality and reliability. While available in a wide range of standard sizes, we can custom engineer them to meet your unique needs. If desired, we can offer turnkey construction and project management to handle the job from start to finish. 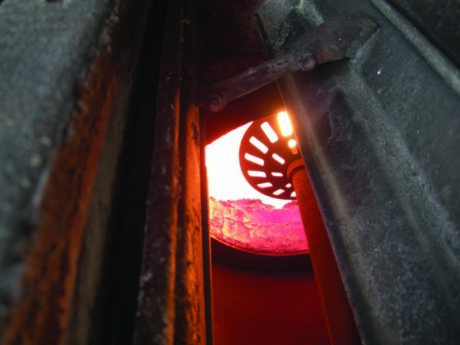 Burner designs use a variety of techniques to reduce flame temperature thus dramatically reducing NOx. 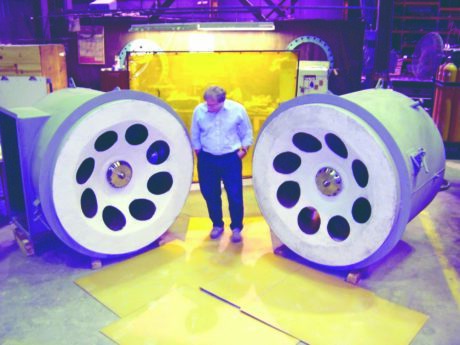 The burner’s refractory baffles allow for strong stabilization and mixing, substantially reducing possible CO generation even at low O2 levels. Allows for a turndown of up to 10:1 for gaseous fuels and 4:1 for liquids. The standard burner accepts preheated combustion air up to 575°F. Higher temperatures, up to 850°F, can be used on burners with a heat resistant steel plenum. If required for safety or economy, adding an insulating inner lining to the plenum is an option. The standard burner requires a suitable high-temperature space to contain the whole flame initiated by the burner. This combustor combines PCC’s burner with a short refractory-lined air-cooled fire tube to mix fuel and air, initiate a stable flame front and provide a high-temperature environment where combustion air is preheated and mixed. This design provides an atmosphere where combustion continues to promote the relatively short and well-defined flame, which exits from the combustor. Limited space is required for completion of combustion. Each burner is custom-designed and manufactured under strict quality control guidelines. 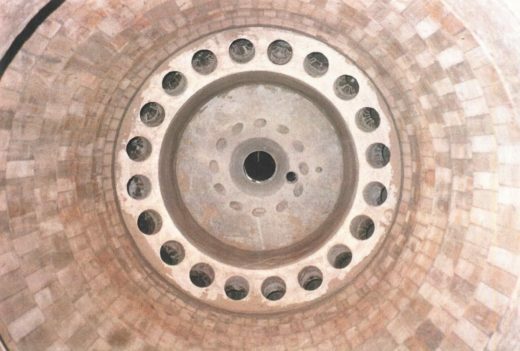 The core of the ruggedly designed burner is the refractory baffle, which shields the burner internals from furnace radiation, allowing long life and stable operation over wide temperature and air/fuel ratio ranges. The standard burner accepts preheated combustion air up to 575°F. Higher temperatures, up to 850°F, can be used on burners with a heat resistant steel plenum. If required for safety or economy, adding an insulating inner lining to the plenum is an option. The standard burner requires a suitable high temperature space to contain the whole flame initiated by the burner. Combustor designs are available for various heat release and preheated air. Contact PCC to discuss your project and learn about our solutions. Systems to control the waste stream from processes where a crude or semi-finished substance (such as metal, oil, or sugar) is converted (refined) into a finished or higher-grade product. PCC’s technical solutions meet all aspects of Tier I, Tier II and Tier III manufacturing processes associated with the automotive industry. Treatment areas range from Dynamometer engine test stations to spray paint booth VOC elimination. PCC's diverse Oxidation technologies provide the end user with options specific to the treatment of dyes, flame-retardants and other chemical treatments used in the manufacturing and treatment of textiles. PCC offers several options for the treatment of off-gases and other wastes associated with the purification and enhanced processing of landfill and digester gases. From simple to very complex systems, PCC can provide a suitable solution. PCC has a full range of oxidation/combustion technologies to treat off-gases for most processes associated with the conversion of raw materials into products. Multiple combustion/oxidation technologies make-up the PCC Solution for industries that are required to treat off-gases from the manufacturing processes specific to the production of non-ferrous metals such as aluminum, copper, and zinc; and ferrous materials such as steel. PCC offers alternative solutions to treat a wide range of process in the Pharmaceutical industry. Thermal and Biological Oxidation technologies, including Flameless Thermal Oxidation (FTO) are possible options. PCC offers a full range of technologies used to treat waste streams generated in the manufacture and refining of both activated carbon, carbon fibers, and carbon black.